Note that since this feature was published Tom Carson has since left Yering Station to make the wines at Yabby Lake. With a history that pre-dates the famous Médoc classification of 1855, the vineyards of Yering Station are amongst the oldest in Australia. Yering Station’s first wines appeared in 1845, made from the long forgotten Black Cluster and Sweetwater grape varieties. By the 1860s, just after the Médoc classification, over 50 acres were under vine, new plantings were with noble varieties brought from France, and the cellars had been furnished with state of the art equipment imported form Bordeaux. The Rathbone family acquired Yering Station in the mid 1990s, and have set about a programme of extending the vineyards, which now cover 272 acres. 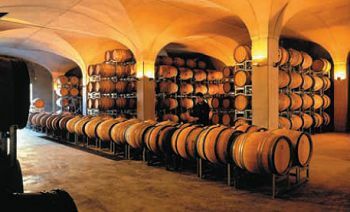 The modern-day Yering Station winery is part of a luxurious and spectacular complex that includes an award-winning country house hotel called Chateau Yering, a fine dining restaurant and a more casual café. Yering is family-owned, though the family has a partner in the shape of the Champagne house of Devaux. The winery lies in the heart of the Yarra Valley, in the state of Victoria, about one hour’s drive east of Melbourne. A cool climate area (cooler on average than Bordeaux), varieties like Pinot Noir and Chardonnay thrive here, though Rhône varieties, Cabernet Sauvignon and Merlot can produce excellent results. 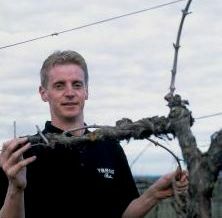 Winemaker at Yering Station since 1996 is 37 year-old Tom Carson (left), who has included a two-year stint in Burgundy in his career so far, as well as time at Tim Knappstein wines and Domaine Chandon. In 2004, Tom rose to real fame within the industry by scooping not one, or two, but three of the most important awards at the International Wine and Spirit Competition in London. Staggering off the stage, he was laden with the trophies for Pinot Noir of the Year, Australian Winery of the Year, and Winemaker of the Year. The Australian wine scene is dominated by ‘shows’: wine competitions akin to agricultural shows, where the wines of a region or style are pitted against each other. Great Pinot Noir is a sensuous wine experience. As Master of Wine Jancis Robinson once said, “If red Bordeaux’s appeal is strictly above the neck, that of red Burgundy is something completely different…” I asked Tom whether making prize-winning Australian Pinot was a product of the head or the heart. There is a nice sense of restraint here, with a creamy, quite honeyed edge of nutty, toffee notes and a ripe, sweet pear fruit. The palate has a racy elegance, with plenty of crisp, focused white fruit and a fine core of acidity that has a luscious quality, but clean, limpid acidity that plays against spice and gentle toffee in the finish. £6.99, Majestic. ‘M.V.R’ indicates Marsanne, Viognier and Roussanne, which come together in this powerful and aromatic Rhône-style blend. It has lovely perfume, with a little floral lift to crisp, Asian pear and a waxy lime and kaffir lime leaf quality. On the palate it is racy and vivacious, though with a mouthfilling texture of rich pear and apple skin fruit, and a dazzling core of grapefruity acidity that keeps it lean and savoury. From £9.99, Majestic, Philglass & Swiggot, Totnes Wine Co. The Pinot Noir Rosé really is a beauty, and much more akin to a lighter style fully-fledged Pinot Noir from Alsace or the Loire Valley than most rosé styles. It has a deep, cherry red colour and fabulous, berry-laden nose. Ageing in French oak barriques adds a delicate smokiness and spicy warmth, with real Pinot character on the palate: a fine truffle and damp earth nuance to sweet strawberry fruit, all wrapped in that sheen of well-judged oak and with a fine core of acidity that shimmers through the finish. £9.99, Majestic. This wine has a light, ruby red colour and a nose with lovely delicacy of cherry, liquorice and raspberry fruit, and fine rose hip notes with a touch of sweet cedarwood. On the palate there is a lovely balance between full, ripe, quite lush chocolate-tinged berry fruit and that keen, savoury edge of cherry skin and redcurrant, all supported by a toasty, tobacco oak. The mouthfeel is silky and full, and this really persists on the palate. From £9.99, Majestic, Oz Wines, Tanners. Dream wines? Domaine De La Romanée-Conti 1978 and Dom Perignon 1996. Best wine memory? Mount Pleasant Light Dry Red 1943 and Domaine De La Romanée-Conti La Tache 1942 and 1966, opened by James Halliday. What you’d eat with your top Pinot? Duck; Peking, roasted or confit. Perfect companions? My two beautiful daughters, Alix (6½) and Tara (2½). You have time to plan an alternative career: Getting paid to play golf and fly around the world playing at the best courses.